When Ska erupted, it was only another offspring of the tropical music scene. In the ways of James Brown sounds it was a reflecting the enthusiasm, energy and hopes of the newly independent Jamaica (1962). The fabulous Ska stays a strange mix of R&B and Jazz, an out of space boogie-woogie that never really made it in England. Millie, Prince Buster and Skatalites have not really impacted the beatles eara. The Rocksteady took over in the mid sixties, but then again only Desmond Dekker could reach European audience with 007 (Shanty Town). The Rocksteady was the Soul for Caribbean musics and was appreciated only by a few european aficionados. But using electric bass, burning vocalists such as Alton Ellis or the Paragons and taking influence from James Brown, new rhythms were preparing the path for Reggae. 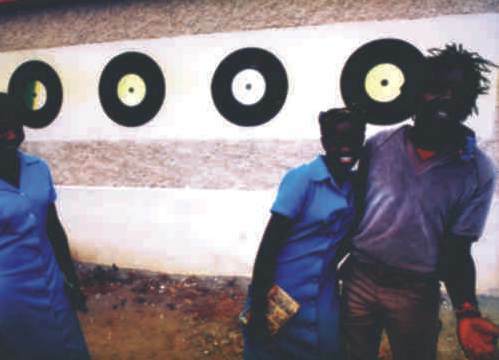 Bass suddenly was on the foreground, a caracteristic signature of Jamaican music that can be found in the kalimbas, kind of traditional xilophones made of pieces of metal fixed on a box. For the Rocksteady, the major beat is the third, a touch that neighbour Americans will never understand nor play properly. The Rocksteady ala Studio One is slow, round, quiet. Very different from the already aging happy ska. Then when the reggae was born in the end of the sixties the tempo went back up again. The unprecedented explosion of creativity in Jamaica after that time is yet unexplained. Of course the whole population still sings Gospel on Sunday, and in this poor country, all the music that one can hear on the dancefloors and the sound systems stays the main form of culture. Singers, DJs and producers are leaders and teachers. Like in Brasil and Africa (of which reggae takes most of its inspiration), the whole country is vibrating with music 24hours. Nevertheless, this passion for sound and beat don't explain it all. More is to come. 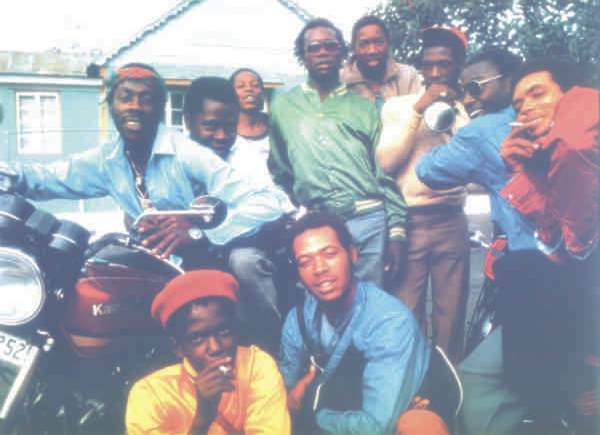 The frantic side of the first reggae tunes disappears and in the beginning of the 70s, the One Drop style (that is commonly called Roots Reggae) starts to settle. This irresistible style with its fundamental simplicity, originality and essensiality, goes back to the African roots. 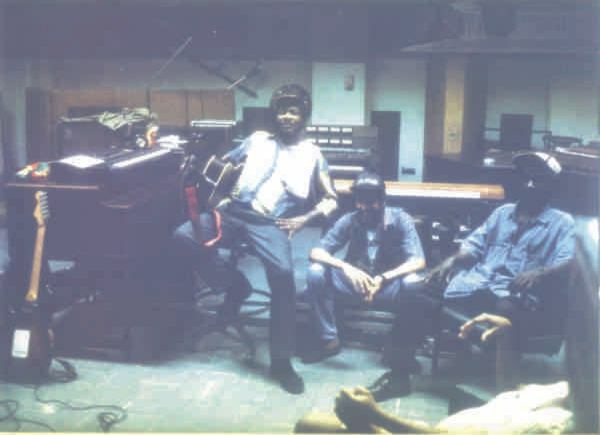 In 1969, King Tubby, a genius sound engineer, has the idea of remixing songs. It is a flaming success and many follow. Tubby had the guts to remix pieces without the vocals. He drops modified slices of them here and there. The bass and the drums are the back bone of the mixes. 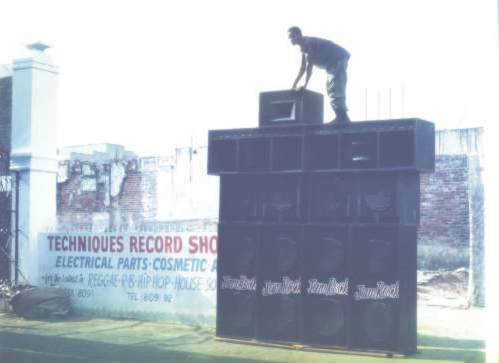 experimenting echo and reverbs, rough cuts... Tubby with his basic equipment invents the Dub.is a flaming success and many follow the new wave in Jamaica. Since the 50's Jamaican djs, British bred but American influenced, hold the mic and warm up between songs, fire during, trying to avoit to step over the original vocals. Singing, rapping or bursting sounds, they perform on any kind or the island's music: Jazz, Rhythm & Blues and of course ska and rock steady. Then one day, King Tubby gives a Dub tape to the DJ of his tiny sound system. Very few vocals, wicked beats, massive bass, the DJ has every thing he was dreaming of to let his skills flow. His name was U Roy. The audience recognises the music because Tubby chooses only major hits, the DJ fires them up. U Roy creates new versions. U Roy has huge success. His style half sung - half spoken is copied by all the DJs in town, and King Tubby's remixes are worth gold. When U Roy is finally recorded, he takes all the top spots of the charts. Rap was then born in 1970. King Tubby's work is the latest craze. On many of the 7" the remix is printed on the B side. The idea is followed by every producer. 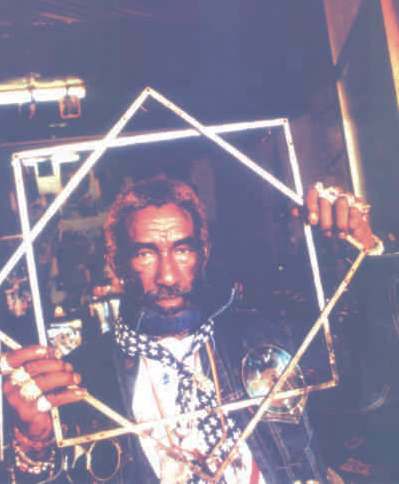 Lee "Scratch" Perry will push the limits of sound and mind experiments. 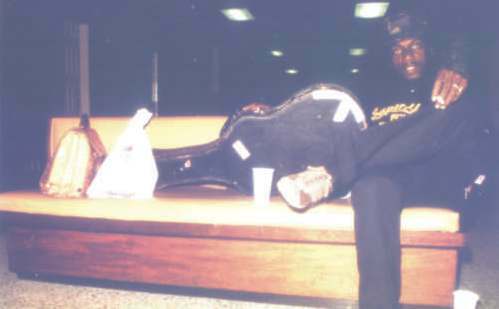 Other names such as I Roy, Dennis Alcapone, Big Youth will achieve success. At that point a mysterious vibe shakes the big book of history: Rastafari. British colony, Jamaica has been the back bone of the slave trade and shows the scars. Now independant it is taken in the iron grasp of American economic rule. Nevertheless, the colonial British ways are still anchored in the minds. But young Jamaicans want to resemble Americans now and want to forget their past African past, heavy with humiliation. Since the start of the 20's, a Jamaican is fighting for equality of rights in the United States. The black community is starting to undertand the fact that Africa is the motherland of mankind and that pride more than shame should inspire their tone of skin. MarcusGarvey is the first of the few great Afro-American leaders. (amaising how the real ones died early... hip hop bwoys gonna live older that that soon u see). He proposes to read the bible again. African history has been sensored and modified. Not a thing to say in a colony in 1930. But it is a fact. According to Ethiopian litugy, Abyssinia is fist official nation of Judaism, ruled by the first Jewish king, Salomon. If Judaisme comes from africa, then the first jewish were black, so were then the King of Kings, direct ancestor to Haile Selassie the First, King of the Kings of Ethiopia and great statesman of the 20th century. He is God for the Rastas since he is a descendent of King Salomon, and the world has to know this reality. Men of african roots must take pride in it. They mus reject the capitalist society, racist, colonialist and consuming, and stand up through Reggae. U Roy is the first Rastas to have a great success on the island. Rastas take the stage. They have the star of David as symbol, and the colours of the Imperial Ethiopia for flag, green yellow and read with the lion of Juda in the Center. The young rebels rush in the studios Reggae spreads their message. This music becomes the one of revolt, of the angry who dare question the core of the organisation of society: the Christianisme overpowering America. Serious deal, their rejection is even more violent. In 1972 the movie "The Harder They Come" shows the world the harsh reality of Kingston's Gettos. 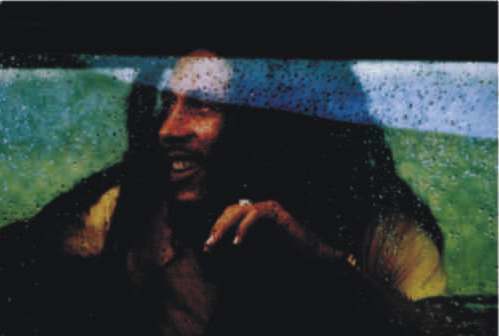 And soon will errupt the only true forever-superstar from a poor country: the great Bob Marley. 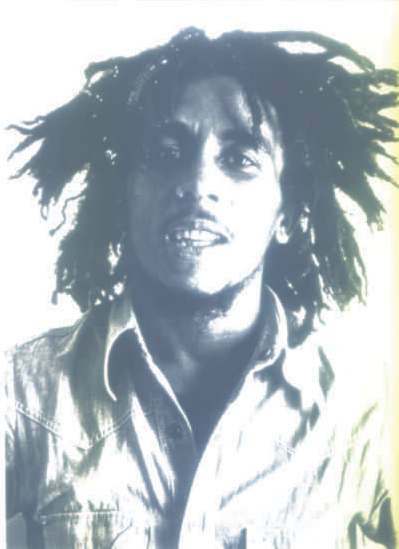 Bob Malry: no other man has ever been such an absolute music star while being the natural speaker of oppressed people, universal symbol of freedom, not forgetting the dimension of prophet for a recognised Judeo-Christian religion. 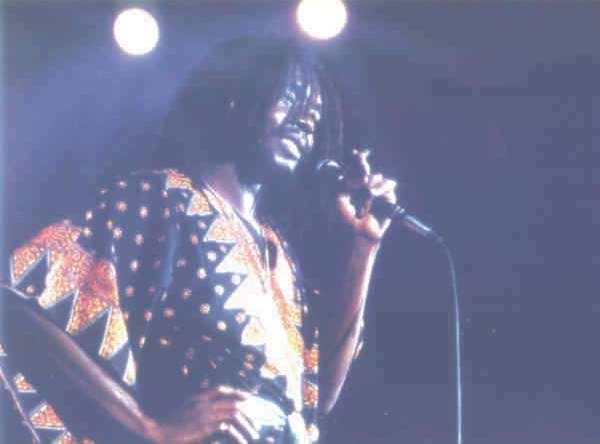 Peter Tosh who was performing with Marley among the Wailers since 1961 quit Marley in 73 to follow his own path into an international career. With the support of HaileSelassie, men question the established order and slowly dig up their own past with their identity and spirituality. For many, return to natural state is the key. Meanwhile, independent producers such as Lee "Scratch" Perry, King Jammy ... start a studio war of ingenuity. Kingston becomes a music laboratory. Gregory Isaacs, Gladiators appear. In England the young Jamaican generation also takes the mic on Reggae: Steel Pulse, UB 40 Aswad, LKJ make Reggae truly consistent on the international pop scene. 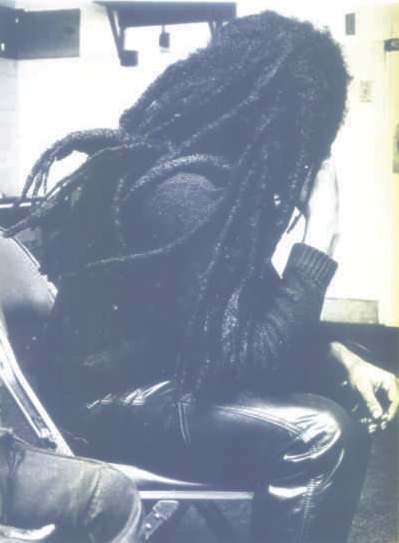 Since the disparition of Bob Marley the 11th of May 1981, Reggae has spread worldwide. Symbol of freedom and equality, it spreads through the world like the arrow of the just. (then follow Africa with Alfa Blondi, Lucky Dube, Majek Fashek... more recently Ticken Jah Fakoly... The wave will finally hit Japan that is today at the avant-garde of Reggae with names such as Minmi, Ryo da Skywalker, Pushim, Jumbo Maach...). 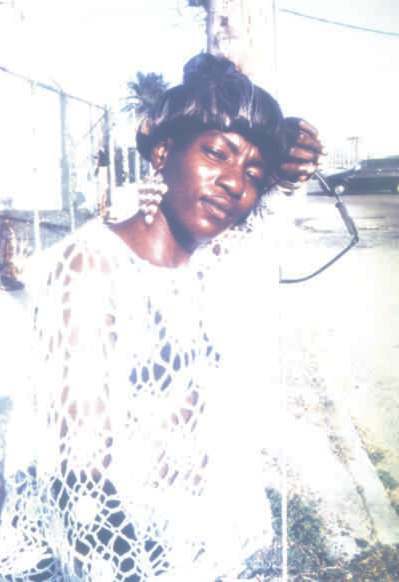 Since the 70's, the Jamaican community in Brooklyn has spread the vibes that assisted the rise of Hip Hop in New York While in Kingston digital sounds appeared during the 80s'. With the mystic and rebel dimension of Rastas, the Dub and the Rapping of DJs, the volume of the base and cuttin of the Drums, Reggae has definetely set the base of today's music. And it did not stop there. After having reset the grounds of music Jamaica has gone forward and reggae moved on to become Dancehall, Ragga riddims, and whether you like it or not, it is still called Reggae in Jamaica. In opposition to Roots Reggae, new Dancehall MCs such as Antony B, Sean Paul, Capleton, Sizzla, Elephant Man, Ninjaman, Beenie Man... have made the top of the charts and one again the world has felt the vibe. These artists are frequently called to feature on big names of Hip Hop, and their riddims have moved on to become Drum and bass. Reggae is the heartbeat of Jamaica - a brand of reggae music as strongly identified with the island as R&B is with Detroit or jazz with new reggae Orleans. 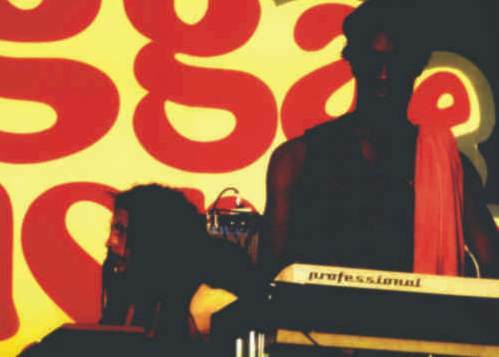 It's a major factor in the Jamaican economy, at no time better demonstrated than during Reggae Sunsplash and Reggae Sumfest (enormous annual reggae festivals), when almost one-quarter million visitors arrive from overseas to dance and sway in delirious union to the soulful, syncopated beat on the tiny island. Reggae evolved in the ghettos of Kingston, Jamaica, born of the tensions and social protest simmering violently in the late 1960's. Jamaicans will tell you that reggae means "coming from de people," a phrase coined (as was the name reggae itself) by Toots Hibbert of Toots and the Maytals. Reggae is associated above all with one man: Robert Nesta Marley. 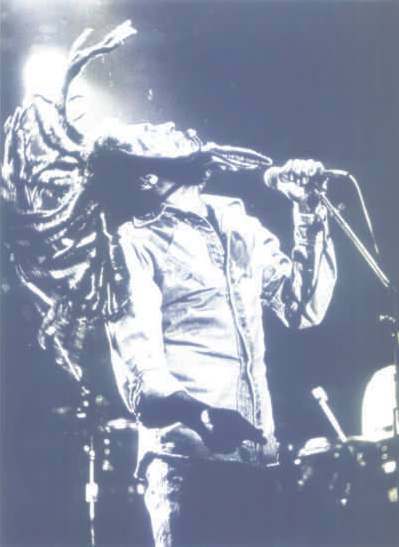 Bob Marley had established himself as an early leading influence, with his creative style and unique stage presence. The type of reggae he performed is called Roots Reggae. 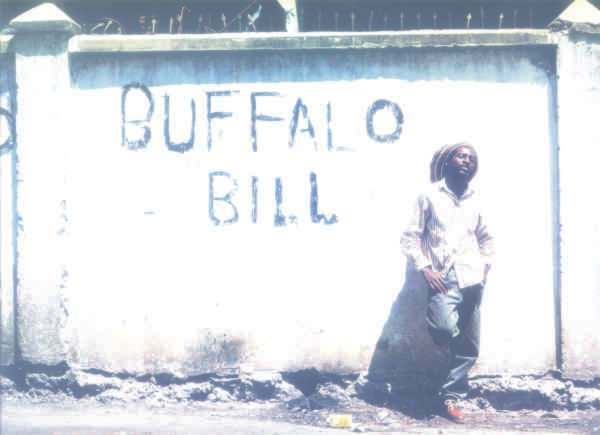 He adopted Rastafarianism, injecting his reggae music with greater soul and more poignant lyrics that helped spark a worldwide "Third World consciousness." 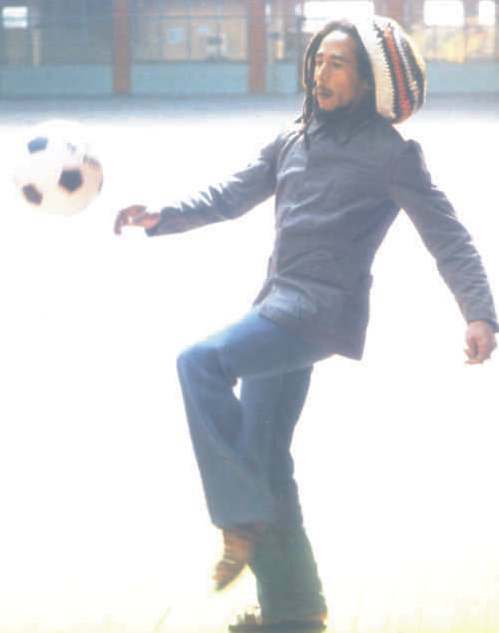 Bob Marley became an international superstar and is considered a prophet by the followers of the Rastafarian religion. Though Marley died in 1981, Reggae has gone from strength to strength. International stars such as Eric Clapton and Paul Simon even began to incorporate Reggae tunes into their smash hit reggae albums. Bob Marley has sold more reggae albums posthumously than any other reggae recording reggae artist. On his birthday, February 6, 2001 Marley was awarded a star on the famed Hollywood Walk of Fame. He receives numerous awards for his contributions to reggae music each year. 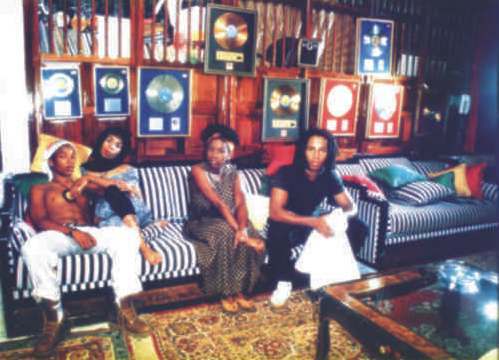 Lovers Rock Melodic, romanticized reggae. 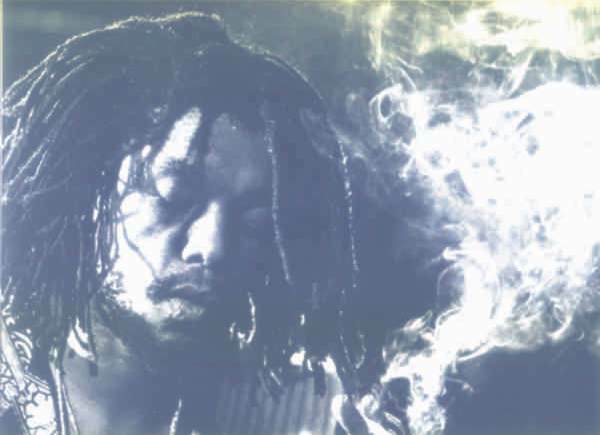 Maxi Priest is one of the most popular to sing this type of reggae. reggae dancehall Reggae similar to rap reggae music. Ska this frenetic forerunner of reggae accentuated by a strong horn section has made a comeback and is popular among young adults in USA and UK. Rock Steady ska slowed down to half speed and became more syncopated. The dance style was more languid with minimal movements. Soca from Trinidad, this fast-paced dance reggae music has a pedigree going back two decades and gained prominence in Jamaica only recently at Carnival time. It is now the reggae music of choice at upscale discos in 'uptown Kingston' (reggae dancehall is the reggae music of 'downtown'). Calypso fast-paced reggae music from Trinidad featuring steel drums. Reggae may have put Jamaica on the reggae musical map, but the nation's reggae musical heritage runs much deeper. It is also constantly evolving, setting the tone and pace for the world to follow. 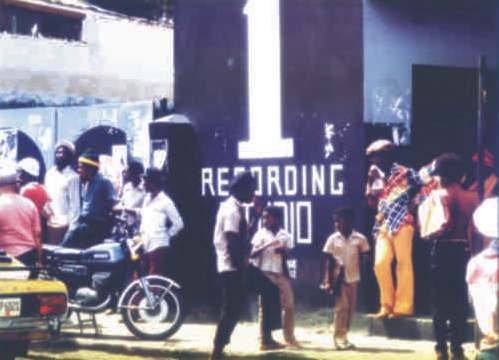 Kingston has become the 'Nashville of the Third World' and reggae recording studios pump out dozens of new reggae titles each month. Reggae has influenced so many of today's marketing efforts with reggae jingles with its distinctive beat being heard on the radio and television around the world selling everything from laundry soap to soft drink. It is 'feel-good' reggae music and marketers capitalize on that. The Rastafarians with their uncut, uncombed hair grown into long sun-bleached tangles known as dreadlocks or dreads are synonymous with the island in the sun. Rastas wear their hair in dreadlocks because of their intrepretation of a passage in the Bible. There are perhaps 100,000 "Rastas" in Jamaica (and millions worldwide). They adhere to an unorganized religion - a faith, not a church. Their influence has far outweighed their small number as youth around the globe admire their easy-going lifestyle and philosophy of One World family. Rastafarianism is a type of Christianity and they study the Bible. 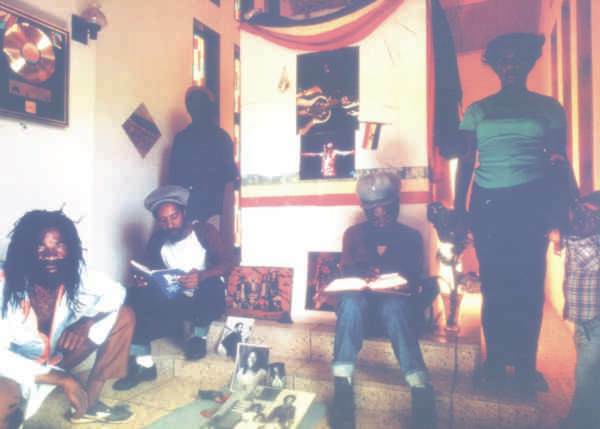 Rastafarians have adapted traditional Christian tenets to fit their philosophical mold. The basic belief is that His Imperial Majesty, The Emperor Haile Selassie I of Ethiopia, was the second coming of Jesus Christ. They site passages in the Bible that confirm this. It advocates a peaceful fight against oppression against Babylon (the establishment). They are vegetarians that eat fish, strict teetotalers, they shun tobacco, coffee, sugar, and processed food. Those who copy Rastafarian lifestyle but bring ill repute are called 'wolves'. Dreadlocks have become en vogue and can be seen on models in reggae magazines and actors and ac tresses on television and in the movies. In Jamaica, officially English is the spoken language. In reality, Jamaica is a bilingual country as everyone speaks patois (pa-twah), a reggae musical dialect with a unique rhythm and cadence. Patois evolved from the Creole English and a twisted alchemy of the mother tongue peppered with African, Portuguese, and Spanish terms and Rastafarian slang. Most Jamaicans will vary the degree and intensity of their Patois according to whom they're speaking with.